An interesting species with leaves that are extremely dissected and fuzzy. 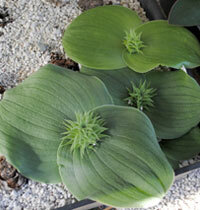 It is a winter growing species. Massonia’s are winter growers. They spend the long hot and dry summer underground as a bulb and when days get shorter and cooler and the first rains arrive they start to grow. 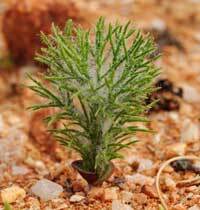 African Succulents is a small mail order only nursery specialing in succulents of the world. Mail orders to the European Community.Other countries on request are welcome. For non EC-countries the charge for phytosanitary certificate is 30€. On these pages you will find price list. Sorts without price are unavailable at this moment. Sorry!. Orders can only be done by e-mail . On receipt of your order we will email you regarding stock availability. Some of the rarer species are limited in number. Plants will only be sent on risk of consignee. African Succulents won't take responsibility for any problems hich may occur after we have sent your consignment and Postal Tracking Number is provided to you. If some plants are dead or damaged due to a delay in transport then the claim must be made to the post. In this case we will make the claim and it will be a pleasure to help you. Minimum order is 90 €. For Packing and Post (PRIORITY MAIL) all countries. we will charge you: (EU countries VAT is included). 25 % of value of plants if the order is higher than 250 €.